About Gigantes Seahorse: This tropical Pacific giant species is majestic, colorful and exotic. The wild population once extended from Equatorial Galapagos Islands to Mexico and even as far north as San Diego during El Nino years. This Pacific sea horse is on the brink of extinction and is no longer found in most of its natural home range. 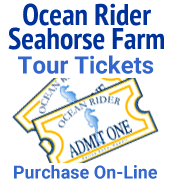 Ocean Rider would like to acknowledge the efforts of Scripps Aquarium in San Diego, CA and the National Aquarium in Baltimore, MD for their successful sea horse conservation and breeding programs for this threatened species. Feeding: Recommended feeding regime for Ocean Rider ® sea horses – is 2 to 7 frozen mysis shrimp (depending on size) from Piscine Energetics enriched with Ocean Rider Vibrance every morning and evening.